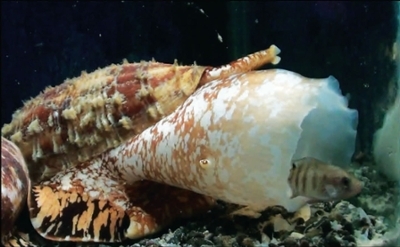 (SALT LAKE CITY) - University of Utah researchers have found that the structure of an insulin molecule produced by predatory cone snails may be an improvement over current fast-acting therapeutic insulin. The finding suggests that the cone snail insulin, produced by the snails to stun their prey, could begin working in as few as five minutes, compared with 15 minutes for the fastest-acting insulin currently available. Biologist Helena Safavi, co-author on a paper describing the cone snail insulin published September 12 in Nature Structural & Molecular Biology, says that studying complex venom cocktails can open doors to new drug discoveries. Human insulin is a hormone that is produced in the pancreas and secreted to aid in the body’s uptake of glucose. The insulin molecule consists of an “A” region and a “B” region. Diabetes mellitus disorders arise from impairment of the body’s normal production of insulin. The most effective treatment for diabetes is injection of synthetic insulin. The Conus geographus snail is a predatory cone snail, eating fish. C. geographus and its relatives have developed complex brews of venoms to rapidly paralyze prey fish. Some snails use venom to overload the fish’s nervous system, sending it into “excitotoxic shock.” Others, including C. geographus, secrete insulin, alongside other compounds, into the water, causing the blood sugar in nearby fish to plummet and sending the fish into hypoglycemic sedation. Once the fish is stunned, the snail engulfs and consumes it. In 2015, Safavi and U biology professor Baldomero Olivera described C. geographus’ so-called “weaponized insulin,” suited for quick action. In a related paper published Aug. 16 in Molecular Biology and Evolution, Safavi and colleagues describe how weaponized insulins evolved rapidly to more effectively target prey. It makes sense because the snail has to very rapidly induce insulin shock in its fish prey, so it has evolved something very fast acting,” Safavi says. Chou studies human insulin for use in an artificial pancreas device that could automatically deliver insulin in response to changing blood sugar levels, much as the natural organ does. The first generation of such a device may be available as soon as next year. Cone snail-inspired insulin, although “still not as good as we want for human use,” Chou says, could replace the current fast-acting insulin used in artificial pancreas development. 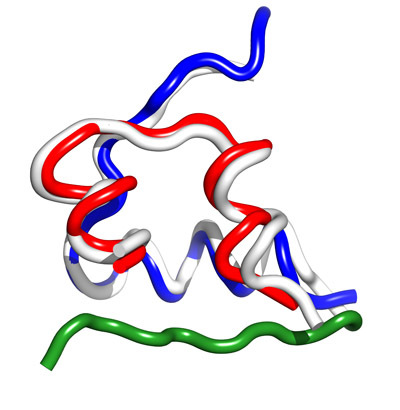 Comparison of the structures of insulin in Conus geographus (red/white) and in humans (blue/white and green). The green B-chain terminal segment is absent in the C. geographus insulin.